Image courtesy of Harvard Common Press. The first and only book devoted to food that’s made to be shipped! 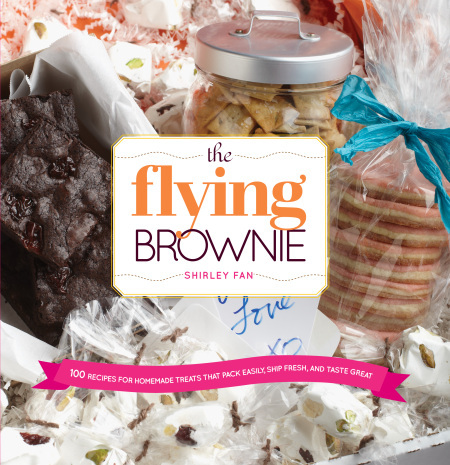 The Flying Brownie is for anyone who has family and friends who live across the country or around the world, or loved ones in the military, at summer camps, or enrolled at out-of-town colleges. It is the only book on making food gifts that are meant to be shipped a long distance; other food-gifting books have scattered information about how to pack food for shipping, and occasional estimates about how long the food will keep, but they are mainly about gifts meant for quick hand-delivery. The book features 100 recipes, each with precise storage instructions and storage times. Chapters are devoted to brownies and bars; cookies; candies and confections; breads and quick breads; extra-light items for inexpensive shipping; savories; and mixes the recipient assembles on delivery. It also covers postal and customs regulations for shipping food.